NIU senior Sarah Wilkinson is visually impaired, but it hasn’t stopped her from developing a plan to help others enjoy what was her first love—the visual arts. The 24-year-old major in Nonprofit and NGO Studies uses a guide dog to navigate around campus and beyond. As a child, Wilkinson says, she was diagnosed with a rare genetic disorder called Von Hippel-Lindau syndrome, which causes benign tumors to grow in the abdomen, spine, brain and eyes. Growing up in Sandwich, not far from DeKalb, Wilkinson’s favorite activities were drawing and painting. When she enrolled at Eastern Illinois University in Charleston, her coursework centered in art and art history. She dreamed of becoming a museum curator. Then, in her senior year, “I went to the eye doctor over Christmas break and never went back to EIU,” she says. Her eyesight continually worsened, and she now can see little except light and dark. The next two years were spent learning to live with that new reality. 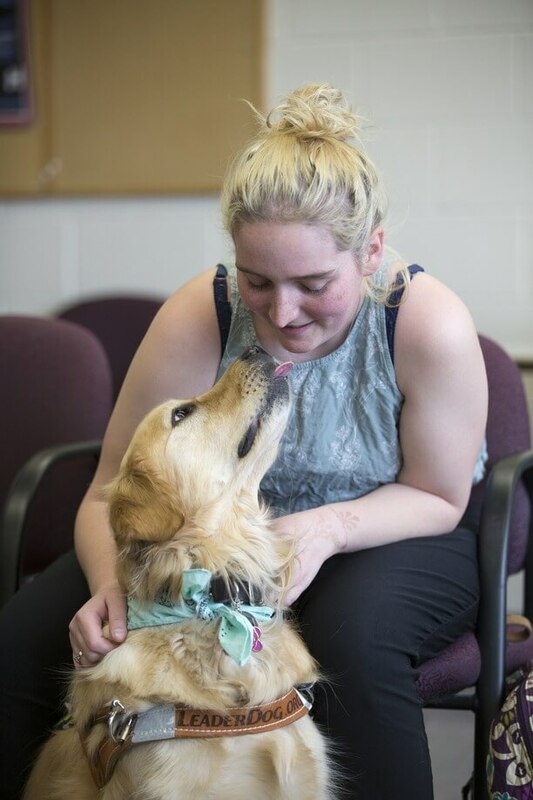 In 2016, she journeyed to a training school in Michigan and learned to work with her new life companion, a golden retriever named Sierra that had been trained to work with people who are visually impaired. Now independent enough to resume her studies, she enrolled at NIU. Julie Ann O’Connell, outreach coordinator at the Center for Nonprofit and NGO Studies, was among Wilkinson’s first instructors. She says the NIU Disability Resource Center worked with her and Wilkinson to provide appropriate accommodations for the course. When O’Connell displayed a PowerPoint, for example, Wilkinson could sit at her desk with an earbud plugged into a screen reader, describing what the slides show, while the other ear listened directly to the lecture. Wilkinson wanted to take her education up a notch by serving an internship. O’Connell suggested she apply for the paid DCNP/NNGO Internship, a collaboration between the DeKalb County Nonprofit Partnership (DCNP)—a program of the DeKalb County Community Foundation, NIU Career Services, and the Center for Nonprofit and NGO Studies. The program is funded by a generous grant from the Douglas C. and Lynn M. Roberts Family Foundation. Julie Eggleston, executive director of the special recreation association, was unfazed. Eggleston put Wilkinson to work writing up a curriculum to teach KSRA participants—most of them are people with intellectual disabilities—how to create art projects. Wilkinson was able to do most of the work at her home, Sierra at her side, communicating with the special recreation association HQ via email and biweekly progress meetings. Eggleston was thrilled by the result. She says the new curriculum is already being used for weekly art classes offered by the KSRA at the Sandwich Park District facility—located, by coincidence, in Wilkinson’s hometown of Sandwich. “Participating in the DCNP/NNGO Internship last semester was an awesome opportunity to see what differences I am capable of making,” says Wilkinson, who will graduate this May. She says she hasn’t given up on that dream of working for a museum. She says the nonprofit and NGO studies major has helped her confirm that belief.